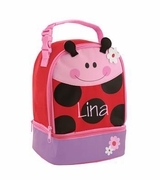 Today's classic lunch box has been transformed into the perfect gift for the little princess girl. 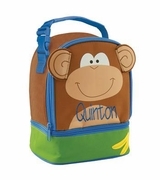 She will be thrilled to be Queen of the Castle when she carries this lunch bag to pre-school or to the playdate with friends. Pack it full of fun goodies! The bag has a lovely dark and light pink striped design running around the edges and compliments the purple background of the castle on the front panel. Towering pink spires rise up from a green field and a polka dot blue panel adds a fun finishing touch. 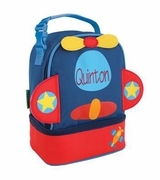 The bag is easy to carry with a grab handle at the top and a front zippered compartment adds extra storage space for small items. Monogram included with purchase.